Evidence has shown impaired cervical flexor muscle motor control and strength in individuals with neck pain disorders. Recent research, investigating deep and superficial cervical muscle coordination, has shown that in a low load craniocervical flexion (CCF) task the deep neck flexors longus capitis and longus colli are specifically targeted This research has revealed that patients with neck pain exhibit increased EMG amplitude of the superficial sternocleidomastoid and anterior scalene muscles, reduced activation of the deep cervical flexors and reduced range of CCF range of motion compared to individuals without neck pain. A low-load program of craniocervical flexion exercise focusing especially on motor control of the deep neck flexors has been shown through clinical trials to reduce neck pain and headache. This type of training has been shown to enhance the pattern of deep and superficial flexor activity in the CCF test when compared to strength training. Furthermore, a higher proportion of patients have shown improved temporal characteristics of deep neck flexor muscle activation following CCF training. In the following review, deep neck flexor assessment and exercise protocols from the peer reviewed literature are described in detail. Position: The test is performed with the subject in crook-lying on a plinth. The subject's head is positioned in slight upper neck flexion by the examiner who places their left hand on the table just below the subject’s occiput. Procedure: The subject completes the test twice on the first day of testing. The subject is given a 3-minute rest between tests. The subject is reassessed 3 days after the initial session, but the test is only performed once on the second testing occasion. Before testing, the subject is given a detailed explanation of the testing procedures, and is then positioned in the start position to assist familiarization with the test. The subject is given verbal and tactile feedback during the test to help maintain the correct test position. This feedback helps prevent a premature end to the tests and assists the subject to achieve a test end point that is a true reflection of their muscle endurance. This feedback may also help reduce problems with kinesthetic awareness. If the subject experiences an unacceptable increase in discomfort, testing is terminated. At the completion of the first testing session, the subject is asked to maintain their normal levels of physical activity until after the second test occasion. Target Movement: The subject is asked to gently flex his or her upper neck and lift his or her head off the examiner's hand while retaining the upper neck flexion. Verbal feedback (“tuck your chin in” or “hold your head up”) is given to the subject when their head touches the examiner's left hand during the test. The test is terminated if the subject is unable to maintain the position of head off the examiner's hand. Objective: Activation, endurance, and isometric contraction of the deep cervical flexors in progressive range positions. Equipment: Inflatable cuff pressure sensor inflated to a baseline of 20mm Hg. This study used StabilizerTM, Chattanooga Group Inc., Chattanooga, TN (Below, Right). This is a standard pressure that is enough to fill the space between the plinth and the neck without pushing it into lordosis. Position: Hook-lying with a neutral neck. Line up the head and neck so that they are straight: if the eyes had a horizontal line between them, the neck would be perpendicular to it. If necessary, a towel can be placed under the head so that a neutral position can be achieved. Procedure: Place the pressure sensor underneath the neck as pictured to the left. Explain to the patient the purpose is not strength but precision. Monitor for substitution of the sternocleidomastoid as pictured to the left. Target Movement: Gently and slowly nod the head as if saying “yes” so that the pressure sensor measures 2 mmHg above baseline, then 4mmHg, followed by 6mmHg, 8mmHg, and 10mmHg without rests in between (the pressure sensor should read 30mmHg at the end of the movement sequence). Hold each increment for 2 seconds, 10 seconds total after all 5 increments. Repeat the highest level achieved with correct form until a total of 10 reps with 10 second holds are achieved. Performance Index Measure: Record the number of times the patient can hold the pressure level. Multiply that by the pressure increment. For example, if the patient was able to achieve 4mmHg without breaking form and could perform 6 reps of 10 second holds without breaking form, the performance index would be 24. The highest performance index possible is 100 (10mmHg x 10 reps). Craniocervical Flexion with Cervical Flexion (A): The head and neck are flexed together on the thorax with the head flexed on the cervical spine. Objective: To strengthen the deep cervical flexor muscles in addition to superficial cervical flexors. 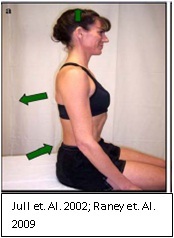 Procedure: Execute an isometric hold of the movement until fatigue three times with one minute rest in between. Cervical Flexion with Neutral Craniocervical flexion (B): the head and neck are flexed together on the thorax without the head flexed on the cervical spine. Objective: To retrain the deep cervical flexor muscles in addition to superficial cervical flexors. Craniocervical Flexion(C): The head is flexed on the cervical spine. Objective: To retrain the deep cervical flexor muscles. Equipment: Pressure cuff manufactured by the Chattanooga group. Position: supine with the pressure cuff placed subocciptally, behind the cervical spine. Inflate the cuff to 20mmHg. Use the pressure sensor as a biofeedback to monitor the flattening of the lordosis by watching for an increase in pressure. Monitor for substitution by palpating the sternocleidomastoid. Target Movement: Perform a gentle nodding motion until full range is achieved. Hold for 10 seconds 10 times. Do not lift the head off of the surface. The patient can stop after they perceive an inability to sustain the contraction at the set intensity. This is pictured above in Figure C.
Objective: Low load training of the longus capitus and longus colli muscles of the upper cervical region and reducing the activation of the sternocleidomastoid. Target Movement: Instruct the patient to concentrate on feeling the back of the head sliding in the saggital plane on the plinth while performing a slow and controlled craniocervical flexion movement. Avoid retraction. Procedure: Place the pressure sensor subocciptally, underneath the neck. Monitor for substitution of the sternocleidomastoid. The target level for the exercise is the level that the subject can hold steadily for 5 seconds while moving smoothly into the range and without retracting or using superficial neck flexor muscles. Target Movement: Gently and slowly nod the head as if saying “yes” so that the pressure sensor measures 2 mmHg above baseline, then 4mmHg, followed by 6mmHg, 8mmHg, and 10mmHg without rests in between (the pressure sensor should read 30mmHg at the end of the movement sequence). Hold each increment for 5 seconds. Objective: To improve the endurance of the cervical flexor muscles. Procedure: Find the patient’s 12 repetition max so that they fatigue at the end of 12 reps with the onset of fatigue at the end. If the patient is unable to perform 12 reps against gravity without weight, incline the head of the treatment table to create a gravity reduced condition until 12 reps are achieved. Instruct the patient in proper form without weight. Make sure that the craniocervical spin is maintained in a neutral position when the head is lifted off the plinth. To progress, add weights in 0.5kg increments until the new 12 repetition max is found. Target Movement: See figure B on the right. Dosage: First two weeks do 3 sets of 12, slowly building up to 3 sets of 15. Over the final 4 weeks, the 15 repetition max was determined and practiced until 3 sets of 20 could be performed. Equipment: An air-filled pressure sensor (Stablizer, Chattanooga South Pacific, Australia) is used to monitor the subtle flatting of the cervical lordosis that was expected to occur with the contraction of the deep neck flexors. Position: The patient lies down in the supine position with the weight of the head and the cervical spine supported by towels under the occiput in a neutral position. The patient is requested to place the tongue on the roof of the mouth, to keep lips together and teeth slightly apart to eliminate activity of the jaw depressors. Procedure: The sensor is placed subocciputally behind the neck and inflated to 20 mm Hg, which is sufficient to fill the space between the testing surface and the neck without pushing the neck into lordosis. Target Movement: Guided by an experienced physiotherapist, the patient is instructed to slowly nod the head in an action indicating “yes,” so that the pressure level rises. The pressure that can be achieved and held in a steady manner for 10 seconds is called the activation score. The patient is asked to practice a 10-second hold at that activation score with the visual feedback of the pressure sensor for 10 minutes with 15 seconds’ break between each hold, or until the patient feels tired and is unable to control the contraction. Loss of control of the contraction is reflected in a loss of pressure as demonstrated by the air-filled pressure sensor. Position: Subjects are positioned on a plinth in a supine crooklying position. The starting position is standardized by placing the craniocervical and cervical spines in a position in which the subjects’ forehead and chin are horizontal and in an imaginary line that is parallel to the plinth and extended from the tragus of the ear and bisects the neck longitudinally. Procedure: An air- filled pressure sensor is positioned suboccipitally behind the subject’s neck and set to a baseline pressure of 20 mm Hg. The subject is instructed in how to do CCF, and they practice the head-nodding action to progressively reach incremental targets and hold the 5 pressure levels for 10 seconds between 22 mm Hg and 30 mm Hg. Any substitutions such as neck retraction are identified by the examiner using visual inspection of subject performance from the lateral side and are discouraged. The combined movement of CCF and cervical flexion (head lift with chin tuck) is also practiced in preparation for the reference. Target Movement: The CCF test consists of 5 incremental movements of increasing CCF. During the CCF test, subjects are required to perform gentle nodding motions of CCF that progress in range to increase the pressure by 5 incremental levels, with each increment representing 2 mm Hg. The starting pressure is 22 mm Hg, and the ending pressure is 30 mm Hg. The pressure is reviewed by the examiner to ensure that the subject reaches each pressure target and maintains the pressure steady on the target. The subject is instructed to perform the combined movement of CCF and cervical flexion. This movement consists of a full CCF chin nodding action, followed by cervical flexion to lift the head so that it just clears the plinth. The investigator observes this motion in order to ensure that the movement is being performed correctly. This contraction is maintained for 10 seconds and is repeated twice, with a rest period of 30 seconds between contractions. Subjects then perform the 5 stages of the CCF test, going from 22 mm Hg to 30 mm Hg and maintaining steady pressure on each target for 10 seconds. An interval of 30 seconds is given between contractions. Between contractions the investigator checks the subject’s head and neck position to ensure that the subject returns to his or her starting position. Objective: Craniocervical flexion is a low load test and assesses a subject’s ability to slowly perform and hold a precise upper cervical flexion action without any voluntary flexion of the mid and lower cervical spine. Position: The test is performed with the patient supine lying with the weight of the head supported. Procedure: The inflatable pressure sensor is placed behind the neck and is inflated to 20 mmHg. This is sufficient to fill the space between the testing surface and the neck without pushing the neck into a lordosis. The pressure sensor monitors the slight flattening of the cervical lordosis which occurs with the contraction of the deep neck flexors and registers as an increase in pressure. Target Movement: Subjects are taught the action of a slow and gentle head flexion as though nodding to indicate “yes” with a hold of the position. Signs of incorrect performance, such as jerking the chin down with a fast movement or performing a chin retraction action to push the neck onto the sensor, are corrected in the instruction phase. For the test, the pressure increase that the subject can achieve and hold with a controlled upper cervical flexion action is assessed (activation score). This pressure is then used as the target pressure for the subject to achieve in the 10 repetitions of the lo-set holding test. Subjects viewed the dial of the pressure sensor to target the nominated pressure. Any unwanted head lift and general cervical flexion will lift the weight of the neck off the sensor and result in a decrease in pressure. The holding capacity of the deep neck flexors is assessed by monitoring the subject’s ability to sustain the upper cervical flexion position at the achievable pressure in a preset task of attempting 10 repetitions of lo-set holds. Loss of pressure of greater than 20% of the target is regarded as failure and the number of repetitions to that point is used in the calculation of holding capacity. Performance Index Measure: The holding capacity is calculated by multiplying the target pressure achieved by the number of successful repetitions. For example, if a subject can achieve an increase in pressure of 10 mmHg with the upper cervical flexion action and repeat this performance 10 times, he/she is awarded a performance index of 100. Indications: Patients with neck pain disorders; acute, subacute and chronic presentations. Contraindications: The presence of neural tissue mechanosensitivity causing pain with movement of craniocervical flexion would delay the test in its current format until this sensitivity has resolved. No head or neck pain should be experienced during this test. Position: The subject is positioned in supine, crook lying with the pressure biofeedback in place and is given the dial to guide performance of the test. Procedure: The air filled pressure sensor is inserted between the testing surface and the upper neck to monitor the slight flattening of the cervical lordosis associated with the contraction of the deep neck flexors. Target Movement: The subject is requested to slowly feel the back of their head slide up the bed in a head nod action to elevate the target pressure from 20 to 22 mm Hg and to hold the position for two or three seconds before relaxing and returning to their starting position. If the subject has an apical breathing pattern, the nod should be performed on exhalation. This process is repeated through each 2-mm Hg increment of the test to 30 mmHg. The clinician analyzes the motion of the head and the muscle activity in the superficial flexors by observation or palpation. The motion should be a head rotation of progressively increasing range through the five stages of the test, and there should be negligible activity palpated or observed in the SCM or AS muscles until the last 1 or 2 stages of the test, if at all. 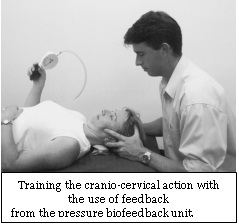 Signs of abnormal patterns or poor activation of the deep cervical flexors include the following: the range of head rotation does not increase with progressive increments of the test and the movement strategy becomes more of a head retraction action; the patient lifts the head in attempts to reach the target pressures; the movement is performed with speed; there is palpable activity in the superficial flexor or hyoid muscles in the first three stages of the test; the pressure dial does not return to the starting position, and reads a pressure greater than 20 mm Hg, indicating an inability to relax the muscles after a contraction—an inability to relax the scalenes is often palpated with this occurrence. Performance Index Measure: The stage of the test (increment of pressure increase) that the patient can achieve and hold for 2 to 3 seconds with the correct craniocervical flexion action, without palpable activity of the superficial flexors provides quantification of performance in this stage of the test. This stage is conducted when the patient can perform the correct craniocervical flexion action, even if they cannot reach all target pressures. It is delayed when substitution movements are observed in stage 1 of the test. Objective: Testing isometric endurance of the deep cervical flexors at test stages that the patient is able to achieve with the correct craniocervical flexion action. Position: The patient is positioned in supine, crook lying with the pressure biofeedback in place and is given the dial to guide performance of the test. Target Movement: The patient performs the head nod action to first target the lowest level (22 mm Hg) and holds the position for 10 seconds. In assessment, if the patient can perform at least 3 repetitions of 10-second holds without substitution strategies, the test is progressed to the next pressure target. The clinician continues to observe the movement strategy that the patient uses to ensure that it remains a craniocervical rotation. Signs of reduced endurance at the test increment include the following: the patient cannot hold the pressure steady and it decreases (although they seem to be holding the head in the flexed position); the superficial flexors are overtly recruited; and the pressure level is held but it is with a jerky action, suggesting an alternate muscle is being sought by the patient to hold the pressure level, and most likely indicates weakness or fatigue of the deep cervical flexors. Performance Index Measure: The baseline assessment is documented as the pressure level that the patient can hold steady for repeated 10-second holds, with minimal superficial muscle activity and in the absence of any other substitution strategies. Position: The subject is positioned in supine lying. Procedure: The subject is first taught to perform a slow and controlled craniocervical flexion action. They are then trained to be able to hold progressively increasing ranges of craniocervical flexion using feedback from an air filled pressure sensor placed behind the neck. Training of these neck muscles is also incorporated into postural correction exercises performed regularly throughout the day in the sitting position. The subject is trained to sit with a natural lumbar lordosis while gently retracting and adducting their scapulae and gently elongating their cervical spine to facilitate the longus colli. Target Movement: Slow and controlled craniocervical flexion action, holding progressively increasing ranges using feedback from the pressure sensor. Dosage: The subject practices the CCF exercise twice daily to increase the endurance capacity of the deep cervical flexors. The active treatment, extending over a period of 6 weeks, includes a minimum of 8 and a maximum of 12 treatments. None of the treatment sessions are longer than 30 minutes. Objective: To activate the deep neck flexors in a functional position. Position: Seated with feet flat on the floor and buttocks fully supported by the surface. Set the height of the surface so that the patient’s thighs are inclined slightly down so that the hips are flexed about 100o to encourage anterior pelvic tilting for a neutral lumbar spine. Place a maker on a wall within the line of sight directly in front of the patient. Procedure: Ask the patient to sit in a way that is comfortable and focus on the marker. Then ask the patient to “sit up straight the best way they knew how.” Then place the patient in a neutral position with verbal and manual guidance. Target Movement: Gently roll the pelvis forward such that the patient sits directly on top of the ischial tuberosities. Instruct the patient to move the thorax slightly upwards and forwards for a slight sternal lift. Monitor for excessive thoracolumbar extension. Gently and minimally lift the occiput to position the head in a neutral position, away from any upper cervical extension. See picture on the left. Dosage: Practice this entire procedure twice in the clinic. ↑ 1.0 1.1 Jull GA, Falla DL, Vicenzino B, Hodges PW. The effect of therapeutic exercise on activation of the deep cervical flexor muscles in people with chronic neck pain. Manual Therapy. 2009; 14: 696–701. ↑ Jull GA, O'Leary SP, Falla DL. Clinical Assessment of the Deep Cervical Flexor Muscles: The Craniocervical Flexion Test. Journal of Manipulative and Physiological Therapeutics. 2008; 525-533. ↑ Cagnie B, Dickx N, Peeters I, Tuytens J, Achten E, Cambier D, Danneels L. The use of functional MRI to evaluate cervical flexor activity during different cervical flexion exercises. Journal of Applied Physiology. 2008; 104:230-235. ↑ O’Leary S, Jull G, Kim M, Vincenzino B. Specificity in Retraining Craniocervical Flexor Muscle Performance. Journal of Orthopaedic and Sports Physical Therapy. 2007; 37(1):3-9. ↑ Chiu TT, Lam TH, Hedley AJ. A randomized controlled trial on the efficacy of exercise for patients with chronic neck pain. Spine. 2005; 30(1): E1–E7. ↑ Falla D, Jull G, Dall'Alba P, Rainoldi A, Merletti R. An electromyographic analysis of the deep cervical flexor muscles in performance of craniocervical flexion. Physical Therapy. 2003; 83: 899-906. ↑ Jull G, Barrett C, Magee R, Ho P. Further clinical clarification of the muscle dysfunction in cervical headache. Cephalalgia 1999; 19: 179–85. 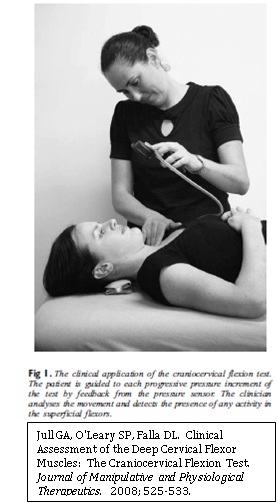 ↑ Jull G, O'leary S, Falla D. Clinical assessment of the deep cervical flexor muscles: the craniocervical flexion test. Journal of Manipulative and Physiological Therapeutics. 2008; 31: 525-33. ↑ Jull G, Trott P, Potter H, Zito G, Niere K, Shirley D, Emberson J, Marschner I, Richardson C. A RCT of exercise and manipulative therapy for cervicogenic headache. Spine. 2002; 27: 1835-1843. ↑ Falla D, O’Leary S, Fagana A, Jull G. Recruitment of the deep cervical flexor muscles during a postural-correction exercise performed in sitting. Manual Therapy. 2007; 12: 139–143.